Eli Pandolfi, nineteen, is a horn player studying at Manhattan School of Music. Born in St. Louis, Missouri, Pandolfi comes from a musical family with a history of professional horn playing. 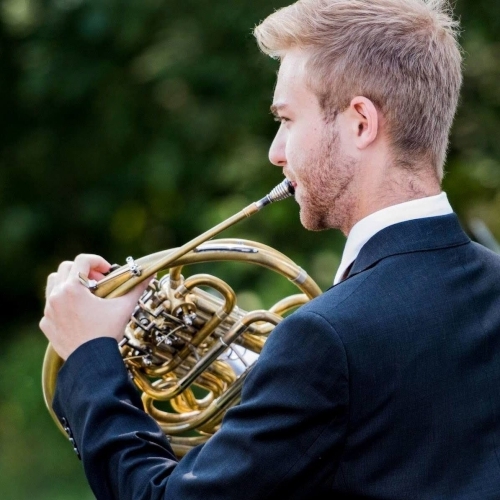 Exposed to the world of classical music at a very young age, he began playing trombone at 11 and excitedly switched to horn once it became available at his school. Soon afterwards, he began to study with Tod Bowermaster of the St. Louis Symphony, and quickly became involved in a multitude of youth ensembles in the St. Louis area, including three years in the St. Louis Symphony Youth Orchestra. Shortly after sitting in an orchestra for the first time, Pandolfi became aware of his love for orchestral playing and started pursuing a career in orchestral performance. He decided to attend Manhattan School of Music after being accepted into Javier GÃ¡ndaraâ€™s studio, and is currently in his second year of study. Upon completion of his studies at MSM, Pandolfi will pursue a professional orchestral career.